An adventure game for just one person - YOU! The world of Arax is a world filled with blood and battle, magic and monsters, slaughter and sorcery. It is a world where the weak are crushed and the strong survive, where those who are bigger and more powerful bully those who are weaker and more vulnerable. It is a world in need of a Hero, someone who can stand against the darkness and fight on behalf of the downtrodden. A Hero like YOU. 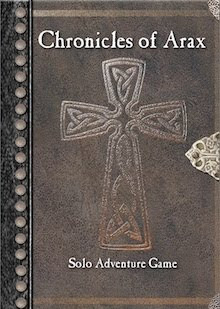 Chronicles of Arax is a game where you, the reader, takes on the role of a Hero in the world of Arax. It is your job to fight against evil and injustice, to undertake various Quests to further the goals of good, and hopefully get some fame and loot in the bargain! In Chronicles of Arax, you take on the role of a mighty Hero who, in the face of utter darkness, stands up for the light by undertaking missions and adventures (known as Quests) that will hopefully aid the forces of light. Throughout Arax a Hero can come from any walk of life, be it a noble Knight, an elf Druid or a stalwart dwarf Stone Warrior. This rules manual includes one Hero type for you to play as: the Adventurer. The Core Rules are free, and premium expansions are available for $1 each. Tonight, I am mostly being beaten up by drunk goblins. Nobody said going into Bloodfyre Mountain would be easy, but man, I'm hitting them, but their armour and general endurance means I'm not making much progress. Not to mention starving in the maze. Surviving the Great Orc in The Fighting Pit would have been nice had I not also been stripped of all of my possessions, but I didn't survive, so crawling naked to the next encounter was a humiliation forewent. It's tough. I went in alone. It is a "solo" adventure, after all. I went in three times tonight, each time that healing potion let me down. You really hope for more than a 1 or 2 points from a 1d6 healing potion. How am I going to get to play The Dark Citadel if I can't get one warrior through the starter quest? How am I going to have the pleasure of buying new weapons and armour, ascend levels and gain new abilities, if I get clobbered by a drunk orc or poisoned by a shaman? By playing it again. That's how. I think I'm addicted. It's fun and fairly random and after a short while familiar encounters become really personal. Because of the way the numbered sections are laid out, when you first look at text in the actual adventures in the Chronicles of Arax range, you'd be forgiven for thinking that you were looking at a solo gamebook or a linear list of encounters (okay I did, but I get a little blinded by the phrase "solo" these days, as I rediscover Fighting Fantasy, Lone Wolf and Fabled Lands...). It's neither. The experience of play is closer to an immersive, well written, random dungeon generator - without having to lay out any room tiles. A die is rolled - the result matches a text section- an area is explored or a beast is encountered, sometimes there's special treasure, but with each new exploratory die roll a number is added based of the number of successful encounters prior to that. This means that despite considerable randomness that progress towards the quest's goal or final area (Section "20") is inevitable. Unless, of course, you end up in the Maze of Goraz and the whole bleeding thing is reset to zero, grrr. *grin* I think I had a lot of unlucky rolls tonight, but in a way it feels like playing Doom (I) for the first time - easy to pick up and play so you don't mind restarting when you set off an arrow trap. The game mechanics are beautifully simple. Opposing die rolls, ability checks, with simple modifiers for weapons and armour. Strengths and weakness are represented by different types of dice. Strength d6, Magic d4, Endurance d6, for example. After playing with the standard "Adventurer" template, I'm now itching to try out other character types, like the Knight of the Steel Fist. Surely, he starts with better armour? What's his "Fighting Skill" like? The core rules and starter adventure are free, expanded material has a very small charge. In the Chronicles of Arax core rules you will get guaranteed playing time of many hours. I'll be honest. It's a really nice feeling to actually be able to test a game out, without having to organise friends to get together and play a system they've never tried before - or just to have to guess what a product would be like in play. In many ways it reminded me of playing Warhammer Quest on my own (more so than playing a Fighting Fantasy gamebook for instance), or maybe even Talisman (but without the board, which I know is a very odd thing to say). What's interesting about Chronicles of Arax is that technically you don't even need a table to play on, provided there's a corner you roll dice in and something to lean on to write on the character sheet. I think that solo-adventure games are undersold. Often they are passed off as "ideal as an introduction to group play". This would seem almost self-effacing. Maybe the problem lies in the fact that fantasy gamers and games marketers feel the need to describe the hobby as "social", perhaps compensating for a bad press of introspective stereotypes. Often groups of players are long established in the systems their use, perhaps they are in the middle of a D&D4/3.5/d20/retro-clone/Pathfinder campaign, so trying out new systems can be too much of a shift from the norm. In contrast, the solo game genre is more ripe for experimentation. It's really refreshing to pick up some dice using fast play rules, without having to "sell" the concept to other players. Get yourself or a friend the free Core Rules (which includes a character and Bloodfyre Mountain), along with the character sheet and try it out. There's a very high possibility that you'll want to buy the supplemental material, but to be honest, you'd still be spending a lot less than on many other game systems - even if Crystal Star triples their current number of publications. Format: clearly written and well presented in a two column format - it has a very professional polish, and I love some of the eroded fonts, which might be a tribute to earlier game systems. Right, let's get back in there ... Let's hunt some Orc!